The HD-BX12 is a motorized zoom lens CCTV camera that supports 4 video modes: analog CVBS, AHD, HD-TVI, and HD-CVI. This makes this zoom lens security camera compatible with almost every BNC type surveillance DVR (digital video recorders) available. 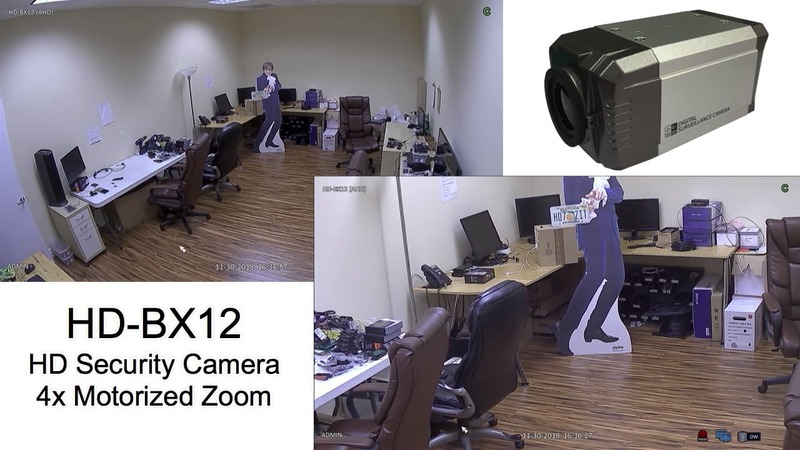 Please watch the above video for a demonstration of this HD surveillance camera. This zoom camera captures high definition video at 1920 x 1080 resolution (2 megapixel). The lens of the HD-BX12 is a motorized 2.8 ~ 12mm which is equivalent to 4x optical zoom. The zoom operation of the camera can be controlled by a DVR or using the controls on the back of the camera. For installation, the HD-BX12 is hard wired to the DVR using RG59 coaxial cable. As with all HD security cameras, they must be used compatible digital video recorder if you intend to record video from them. The HD-BX12 supports UTC (up the coax) for the zoom lens controls. UTC is an alternative to the old method of using RS-485. RS-485 required that an additional pair of cable be run for the zoom lens controls. The UTC commands can also be used to access the camera’s on screen display. RS-485 is NOT supported by this camera. The lens zoom can be controlled via UTC or using the joystick control on the back of the camera. UTC transmits the zoom and menu system controls over the same RG59 cable used for video (so there is no need to run an additional pair of cable). You must use an HD security camera DVR with UTC support to use this feature. For use in low light environments, this camera has a Black and White Lux rating of 0.001. The IR Cut Filter enhances the image quality by blocking any unusable infrared lighting and only allowing the visible light to pass through. This camera can be used in conjunction with external infrared arrays for true zero light night vision. For outdoor installations, the HD-BX12 can be installed in an outdoor security camera housing like the one seen above. 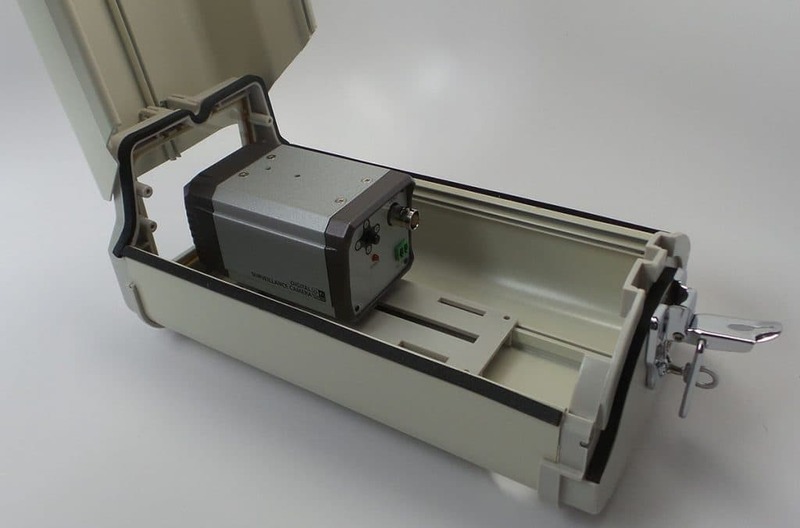 This is the same type of housing used by traditional box CCTV cameras. Important Note: Although this camera supports analog CVBS mode, CCTV Camera Pros does not recommend using the camera in analog CVBS mode. The UTC function for zoom and OSD operations does not work in analog mode. Also, the video quality is not very good in analog mode. We do highly recommend using this camera in the 1080p AHD, 1080p HD-TVI, and 1080p HD-CVI video modes that it supports. You can find this motorized zoom CCTV camera for sale here. What is a motorized zoom lens CCTV camera? A motorized zoom lens CCTV camera is a type of closed circuit security camera that has a variable focus lens that is controlled mechanically and electrically. CCTV cameras use coaxial cable to transmit their video signal, typically to a DVR or viewing monitor. The communication to control the motorized lens can also be transmitted over the same coax cable if the camera supports the UTC protocol (Up the Coax). Cameras that do not support UTC use RS-485 to communicate the zoom commands. RS-485 uses a pair of wire for communication. How can I control the zoom? The zoom lens can be controlled using a compatible DVR. There are also push button controls directly on the camera. 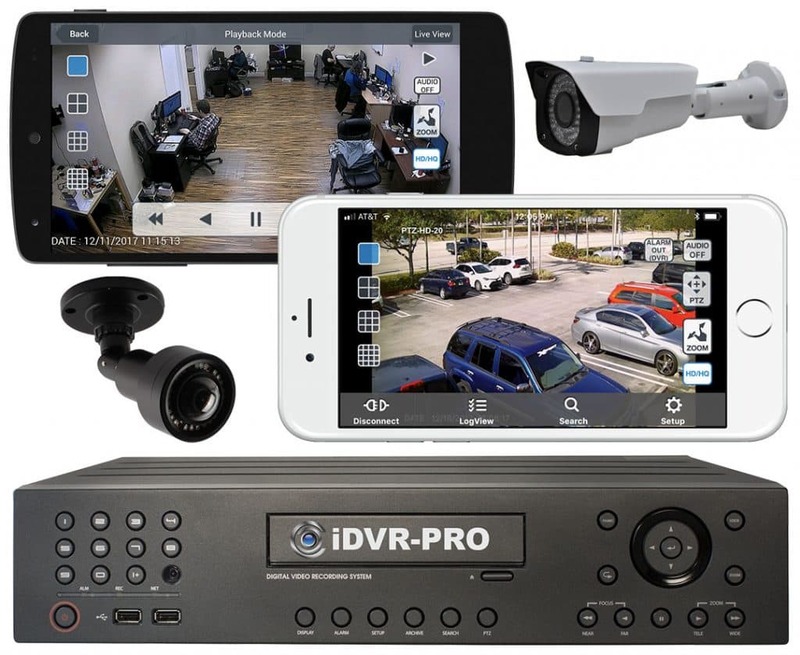 If the DVR that you are connecting the camera to supports remote desktop software and mobile apps for remote camera viewing, it may also support remote zoom control. If it does, you can also control the zoom lens from Windows, Mac, Android, and iPhone devices. What type of cable is used for installation? RG59 Siamese coax cable is the most popular type of cable used for CCTV camera installation because it conveniently runs both video and power. This includes the following HD CCTV camera types: AHD, HD-TVI, and HD-CVI. You can find a detailed CCTV camera installation guide using RG59 Siamese cable here. Can motorized zoom lens cameras be remotely viewed from a mobile? Yes, as long as the camera is connected to a surveillance DVR that supports remote camera viewing. Please take a look at this iPhone app and this Android app that are included with iDVR-PRO HD security camera DVRs. Can zoom cameras be connected directly to a TV monitor, without using a DVR? Yes, motorized zoom cameras can be connected to a monitor without using a DVR. Please take a look at these BNC to HDMI converter solutions that enable this. Motorized zoom cameras are typically used in situations where the customer wants a wide angle overview of an area, but needs the ability to be able to zoom in close to a specific location for a more detail view. 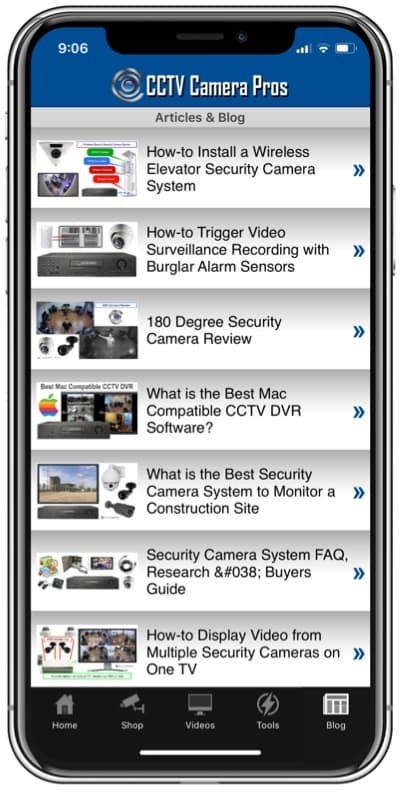 Here are some additional video surveillance products that you may be interested in. Here are some additional videos and articles that you may be interested in.